Although mobile data is surpassing WiFi connections in usage, you cannot download FHD movies or binge watch your favorite shows via mobile internet due to limited data. That is why broadband providers leverage the fact and offer a number of unlimited offers. This time, PTCL has come up with the revised rates on its different packages. Here are PTCL’s packages for ADSL/VDSL and GPON. It needs to be noted here that the internet speed for ADSL is up to 20Mbps, 50 Mbps on VDSL, and 250 Mbps on GPON (Fiber). For more details visit PTCL website. here is ptcl for you. How come you have so much upload speed. Gpon? You’re a lucky guy. Warna PTCL se badtar service shayad hi kisi ki hogi. Nayatel and stormfibre and other private firms are performing way better. they are on fiber so compare them with ptcl fiber only. data i consume in a month can only be provided by ptcl, nayatel is a joke for high consume data users. 100 mbps gpon. but you need separate dual band router to get this over WiFi. 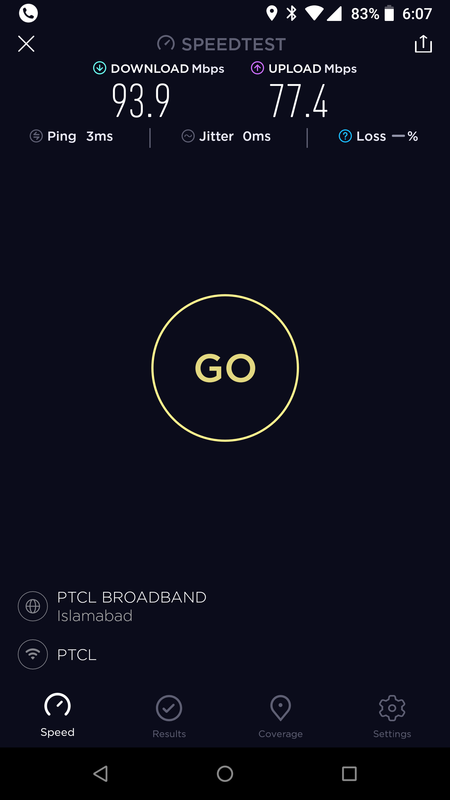 Ab PTCL Sab Ko Peechay Chor Raha Hay, GPON Nay Dhoom Macha Dee Hay Islamabad Main. Mehngay Nayatel Say Jan Chhoot Gayee Hay. Rate Bhe Kam Speed Bhe Behtary. Ask Your Internet Service Provider, there’s a 99% chance that ISP is also utilizing bandwidth of Pathecher Telecom ISP (PTCL). and all other services too are limited to certain area’s. how many area’s / users / cities your precious NBN available? Copper mein static aa jaata hai. remove kerwa leeya karen. PTCL he Nayatel wughaira ko bhi bandwidth farahaam kerta hai. I have Stormfiber, Fiberlnk, National Broadband and Ebone FTTH services in my area. I am paying 1700 including tax for 6 Mbps Ebone connection. Bandwidth for Youtube is 10 Mbps. Why would I go for PeeTCL? Who uses Ebone?? Im paying 1999 plus tax which is ~2500 for StormFiber triple play service. I claim the advance tax at the end of the year for the last 2 years so maybe I effectively pay 2300 but 10mbps. Well worth it. The speed is consistent and digital HD is outstanding. Don’t use the voice line much but good to know I can. I use ebone by a cable operator. Goes offline once or twice everu week. But super cheap and fast. Here FiberLink is 16mbps in 1300rs if paid advance for a whole year. 32mbps at nights. Very good service if works. But goes offline every other week or two. Customer support is very poor. One needs to wait 1 whole year to get fiberlink connection. Even after advance payment and pathetic after sale service. Even PTCL has better after sale service. Thats because you are using PTCL modem. Get a modem of Tenda from Rex city in Rs. 1200 and it will never go offline. PTCL modem causes trouble some times and require reboot. Never used PTCL modem with Ebone. I am switching between these routers Tenda, Mercusys, Xiaomi. Gpon coverage is like nail on the body. I was using 20 MBPS for 2999. Now I’ll have to ether pay 200 more for 25 MBPS (The speed increase is not even going to be noticeable) or save RS 350 and get less speed. What should I do? I don’t have any GPON or FTH Service in my area and PTCL is the best alternative from the rest (worldcall, wateen) . The technique to get a good connection is be friends with the line man. If I have a complaint I just send him a WhatsApp. Mostly kaam time par hota hai. ADSL technology does not support more then 1Mbps upload speed or 2.5Mbps if Annex M is enabled. 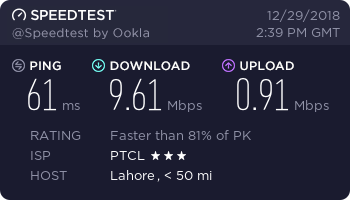 Well that’s fair, BUT if you switch to PTCL Fiber connection as well, you’re getting 10mbps download but 5-6mbps/ish upload. WHY NOT SAME SAME UPLOAD DOWNLOAD THERE??? because very few in the world gives symmetrical connection, most are asymmetrical. You might have enabled it on your modem but at back end it is not enabled by PTCL exchange. You have to contact PTCL Customer Care (1218) in order to enable Annex M. But Annex M is only provided to connections of 8 Mbps and above. ptcl ithasalth se nekly ga tu kamabab ho ga. ya tu apne pensionero ko un ka haq nahi de raha. 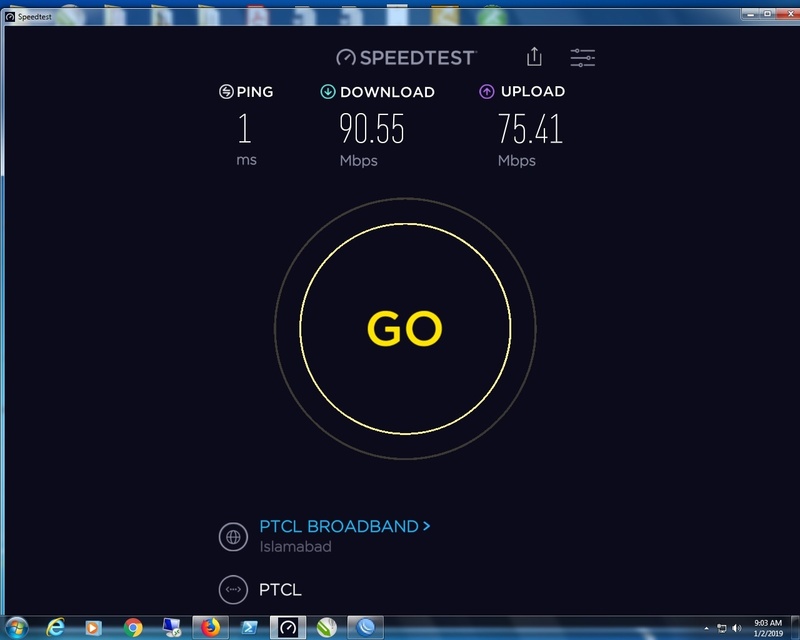 Just upgraded to PTCL 10mbps, koi khaas faraq nahi lag raha. Cable internet ke browsing is say zayada fast aur fresh feel hoti hay, shayad unke uploading speed 4mbps main up bhi 4 he hay. How to enable Annex M? You have to contact PTCL Customer Care (1218) for this. But Annex M is only provided on 8Mbps and greater connections. Did that. Now Annex M is enabled but still not getting more than 1mbps upload. Attainable rates is showing max 1mbps. It is 100 percent because my SNR margins on upstream are less than 6dB. Have complaint to PTCL to improve line quality as well as do feasibility study on my line to check if i can upgrade from ADSL2+ to VDSL. How to check if your area has vdsl? i want to upgrade from 10mbps to 15mbps but my line adsl line won’t be able to support 15mbps. Contact helpline or talk to PTCL web chat support. I have seen only Cybernet/national cable internet service stable in Faisalabad. They don’t disconnect like other cable providers and FiberLink. I am using PTCL since 2008. Started with 2 Mpbs then upgraded to 8 Mbps then 20 Mpbs. Now going to upgrade to 25 Mbps as per revised packages. So far all these years PTCL broadband has performed “adequately” as per my expectations. I have always received advertised speed and downtime has always been manageable. The only complaint I can have is that it is ADSL, so upload is limited to 1 Mbps, but again I am not much of an uploader anyway so it really isn’t a problem for me. 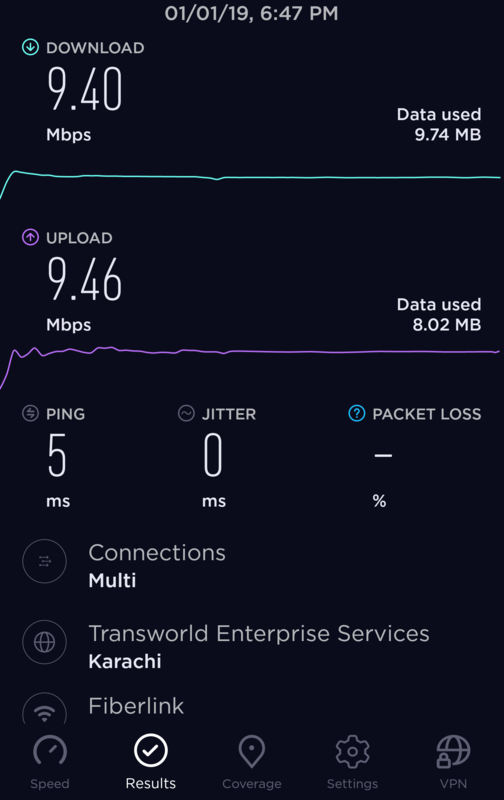 And yes, the PTCL connectivity where i live is on fiber. Just sharing my feedback, so you know that it doesn’t perform as poorly as majority of the people are claiming it here. you send data first to receive anything. call helpline and tell them you want 2 to 3 mb upload, if your line supports this you’ll get 50% improvement in your overall usage. Getting this on VDSL 50Mbps in Bahria Town, Lahore Exchange. This is revamped exchange (Naya Network). Better than ADSL, but still not ablee to get advertised speeds despite having very good parameters. I don’t understand why the last mile is still copper despite investing a lot for FTTN. They are hesitant to expand for FTTH. 1: ptcl says vdsl is max 20mbps unless the exchange to user is all perfect for more. 2: try with hardwired computer and if you get more speed than you need dual band router. In Normal Internet PTCL is best after that Storm Fiber, but its in limited areas. This pathetic company PTCL. Let me tell you what they revise. They for instance removed 10mb packaged and so called upgraded the customers to 15mb without their consent. so the customer has to pay higher amount because they so called revised the freaking packages. What they do is they remove a package and let a lesser package in this case 8mb be there and upgrade to upper package in this case 15mb. and they will convince you like, sir its just 250rs extra but you get 150% more speed, later when you ask them to revert to a lower packages like 8mb they will be sir its just 250rs difference but lowering to 8mb is half a difference in speed bla bla bla. these fukhhras are just a piece of business crap. looting people of this country.